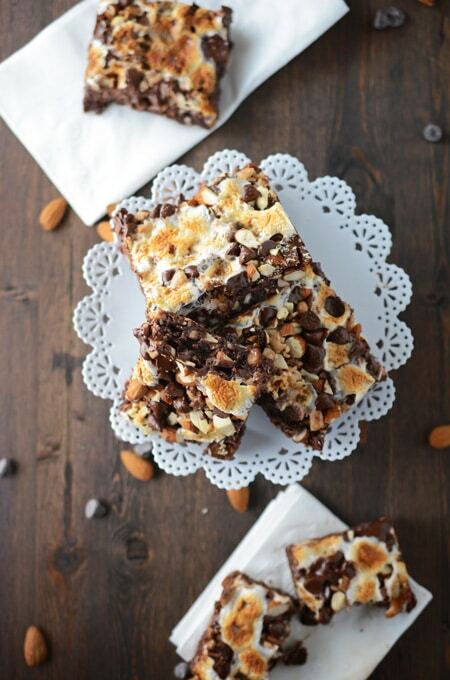 Here is an easy homemade recipe for Rocky Road Bars, sure to impress your friends and family. I love baking cakes and decorating them, but they usually take a little more time in the kitchen. For those of you that don’t want to spend that much time in the kitchen but want a dessert that is sure to impress looks and taste wise, then this one is for you! You don’t even have to turn on your mixer for this one. If you don’t want to melt the chocolate over a double boiler you can microwave the chocolate at 30 second intervals, being sure to stir between each interval so the chocolate does not burn. If your marshmallows aren’t getting that nice golden brown color to them by the last few minutes of baking, turn on your broiler and watch very closely for them to brown. Be careful, the broiler will turn your marshmallows brown fast but within seconds can also burn them, so keep a close eye on them. 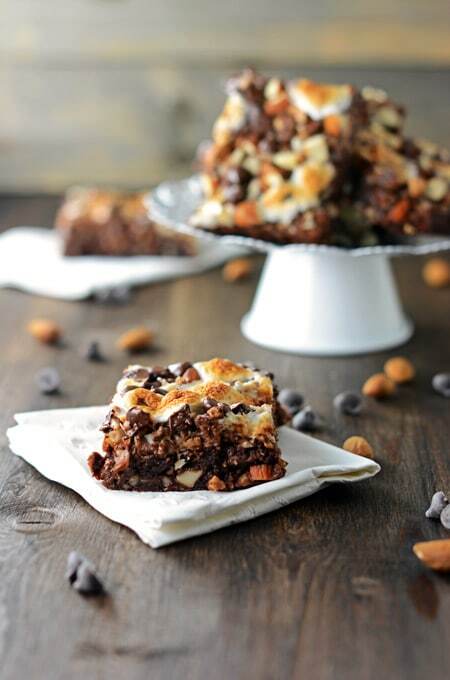 Also check out some of these other Rocky Road favorites: Rocky Road Brown Rice Crispy Treats, Rocky Road Sundae Pie, and Espresso Rocky Road Oatmeal Cookies. Check me out on social media: Facebook, Instagram, Twitter, and Pinterest. And don’t forget to subscribe to The Weekly Recap where I’ll send you one email per week to your inbox with the latest recipe link and what’s coming up in the future. Talk with you next week! Preheat the oven to 350 degrees. Line a 13x9-inch baking pan with 2 pieces of foil (one horizontal and one perpendicular) creating handles at the edge of the pan to lift the brownies out after baking. Spray the bottom and sides of the foil-lined baking pan with non-stick bakers spray and set aside. Place the chocolate and butter on top of a double boiler over barely simmering water. Heat, stirring constantly, until the chocolate melts and the mixture is smooth. Remove the pan from the heat and let the mixture cool for about 10 minutes. Stir the sugar, salt and vanilla into the chocolate mixture. Stir in the eggs, one at a time until well blended and no trace of egg yolk remains. Stir in the flour, just until blended. Fold in the nuts and pour batter into the prepared baking pan and smooth the top with a rubber spatula. Bake for 30 minutes, or until a wooden skewer inserted in the center comes out clean or with a few moist crumbs attached. Remove from the oven and leave the oven on. 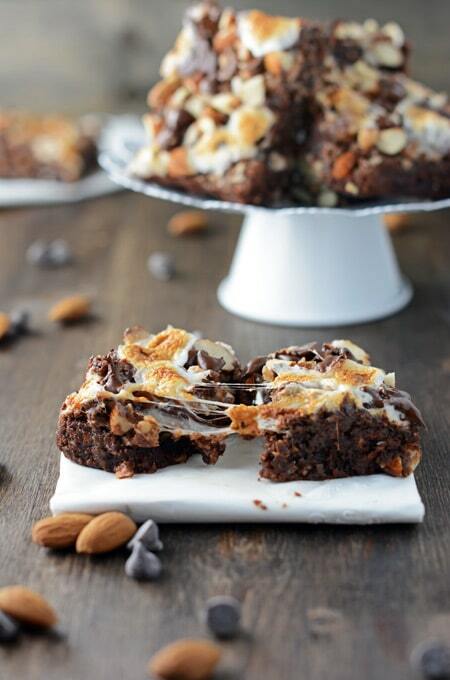 Sprinkle half of the chopped almonds evenly over the hot brownie base. Sprinkle half of the toffee bits, half of the semisweet chocolate chips and half of the miniature marshmallows evenly over the almonds. 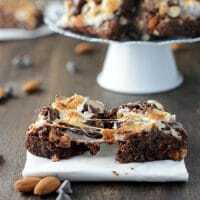 Repeat this process with remaining almonds, toffee, chocolate chips and marshmallows, being sure to press each layer into the brownie base to adhere. 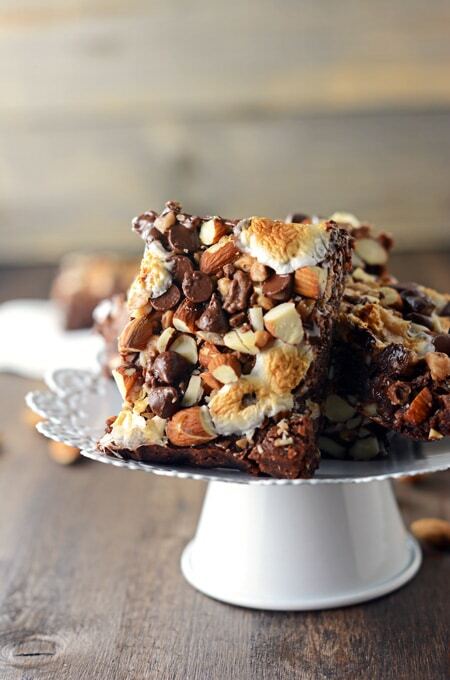 Return the pan to the oven and bake for 5 to 7 minutes, or until the chocolate is partially melted and the marshmallows are soft and lightly browned. Place the pan on a wire rack and let cool for 20 minutes. Lift the bars out of the pan with the foil overhang and using a serrated knife, cut into 16 squares. Serve bars at room temperature. Store in an airtight container in the refrigerator for up to 5 days. Bring to room temperature before serving.